The No S Diet: The Strikingly Simple Weight-Loss Strategy That Has Dieters Raving–and Dropping Pounds was created by Reinhard Engels, a software engineer, who was fed up with rigid and complicated diets that are hard to stick with. After many failed attempts at losing weight he came up with his own diet plan and managed to lose forty pounds with an extremely easy and commonsense approach based on following three basic rules. Dieters should follow these rules on weekdays and are permitted to break them on days that start with S (Saturdays, Sundays and Special days). This is not a diet book in the traditional sense in that there are no meal plans, recipes or special food combinations involved. However by following the recommendations in this book Engels says that you will lose weight and be able to keep it off. You can eat anything you like at meal times however you must limit your servings to one plate. In addition to avoiding traditional sweets such as cakes, cookies and candy it is also necessary to eliminate sugar in foods such as sugary breakfast cereals and beverages such as soda and fruit juices containing added sugar. 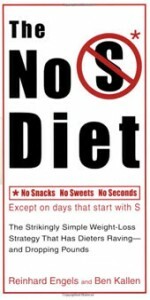 The No S Diet also addresses issues such as emotional eating, food addiction, and other major causes of excessive weight gain. Dieters are reminded that although you are allowed to eat anything you like on S days this does not mean that you have a license to binge on junk food and sweets. It is important not to go overboard otherwise this will neutralize the beneficial effects of monitoring portion size and food intake during the week. Fruit, vegetables, oatmeal, cream of wheat, grape nuts, rye bread, brown rice, pasta, potato, eggs, chicken, turkey, beef, fish, cheese, peanut butter. The No S Diet recommends exercising on weekdays and resting on your S days. You are encouraged to become involved in physical activities that are enjoyable and do not disrupt your lifestyle. A moderate yet consistent approach is recommended while intense or long exercise sessions are deemed to be unnecessary for successful weight loss. The No S Diet: The Strikingly Simple Weight-Loss Strategy That Has Dieters Raving–and Dropping Pounds retails at $13.95. Addresses the psychological aspects of overeating. Dieters don’t have to give up their favorite foods. Teaches dieters how to control portions. Will not interfere with eating in social situations. Lifestyle approach to weight loss and maintenance. Will not appeal to dieters who prefer a structured meal plan. Dieters may consume too many calories if they overeat on the weekends. Results may take a long time to become apparent. Some dieters may experience hunger between meals. Not all snacks are unhealthy. Some dieters may need more guidance to create a healthy diet. Dieters may find that it is easy to stick to the rules of the No S Diet during the week because the weekends are very flexible, which serves to reduce the stress that is generally associated with a lengthy period of dieting. However, it is vitally important that the tendency to overeat on weekends is avoided because this will severely limit your ability to lose weight. It is also important to recognize that some dieters may find it easier to control their appetite and balance blood sugar by following a plan that incorporates healthy snacks between meals such as fresh fruits, raw vegetables and nuts. Even though it looks simple, this diet is not as easy as you think. One needs discipline to not snack in between meals and to only eat one plate of food, no seconds at your meals. If you can get down the discipline and not need to have dessert and snacks every day, it can work for you. The weekends are relaxed and you can eat whatever you want, but you can’t go overboard. I’m still trying to master this diet, it’s not easy but I believe it can be done and it can be very successful. This “diet” has been a miracle for me. It’s so easy to follow, and I have been losing weight at a slow but steady pace. It’s a VAST improvement over all the fad diets out there. If you eat proper meals, there is no reason to “snack” between them, no matter what you’re eating. As for the weekends, when the rules are relaxed, this is NOT a free-for-all binge; you still have to use common sense. Also, there is no need for the book to have recipes in it; it’s no a cook book. You can just cook normal food, and limit your portion size to one plate. Trust me, I am done them all, and this is the one thing I have come across that is both effective and easy to maintain for the rest of your life.